Okay, I know this blog is supposed to be about food, but technically this counts because if you wanted to, you could eat it (a little bit got in my mouth as I was waiting for it to dry and it was delicious). The exfoliating properties in blueberries and yogurt combined with the soothing qualities of the oats and honey leave skin purified, cleansed and refreshed. Why would you shell out $90 for a facial in a spa when you can make this effective (and tasty!) masque yourself? 1/8 cup fresh (or thawed) blueberries $4 for 10 oz. 1/8 cup plain yogurt $1 for 6 oz. 1/8 cup rolled oats $3 for 32 oz. Combine all ingredients in a blender or food processor until a smooth paste forms. Remove any makeup from face and dry completely. 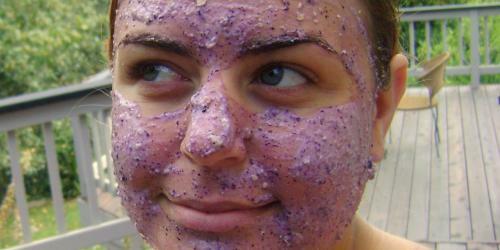 Slather masque all over face (and neck if desired) and allow to dry (about 20 minutes). Gently wipe masque off with a damp washcloth. Rinse off completely, pat dry and apply moisturizer. Note: leftover masque will keep in the fridge in an airtight container for up to a week.